Tom LaBonty, from Portland, Oregon, is not your typical bicycle manufacturer. He’s not a trained mechanic, but he is truly skilled at his craft. He builds Dutch style cargo bikes for people around the country interested in using them for fun, like his beer bike, or for replacing their car or truck to use for errands around town. We reached out to him after seeing this documentary (trailer) at a Dinner and Bikes event in Ft. Worth a few months back. 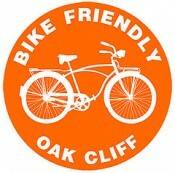 Seems he had been thinking about doing a workshop already, yet he had no idea his first wouldn’t be in one of the most bike friendly cities in the U.S, but right here in Dallas or more specifically in Oak Cliff! We sincerely hope you take the time to attend this event. There’s a very small fee to attend of $16 dollars, but that get’s you food and beverages for both days. Check out the video mentioned above and his website. He’s got some great pics and stories of his finished products! Description: A unique, one-of-a-kind opportunity for builders and bystanders to watch and learn how to make a Dutch style cargo bike. Tom Labonty with Tom’s Cargo Bikes from Portland, Oregon will conduct a 2 day workshop on how to build one of his cargo bikes using found and used parts. To see him in action, check out this trailer of One Less Truck. During the workshop, you’ll learn how to construct a Dutch style cargo bike using found or used parts. Lunch and beverages included. Thank You to Our Sponsors..
Tomscargobikes.com is an inspiration for my 11 yr old and I. We are building a bike based on toms examples. Through the process my son is learning how to plan ahead in his construction. He is seeing that with a little ingenuity it’s possible to do anything. The best part is that we work together, talk a little, work a little. Probably one of the best parts of my week.